I don't think I have done an outfit post since I was pregnant with Poppy… almost one year ago. I suppose I thought it was more interesting to document a growing belly. And to be honest, most of my day to day outfits now consist of jeans and t-shirts, maybe a casual dress if we're off to the farmers market. But you do need to dress up for a wedding, and I was lucky enough to have my mother-in-law take me shopping. This past weekend we travelled to BC's Sunshine Coast to attend a family wedding, and I wanted to wear something that reflected the west coast beach vibes without being too casual. 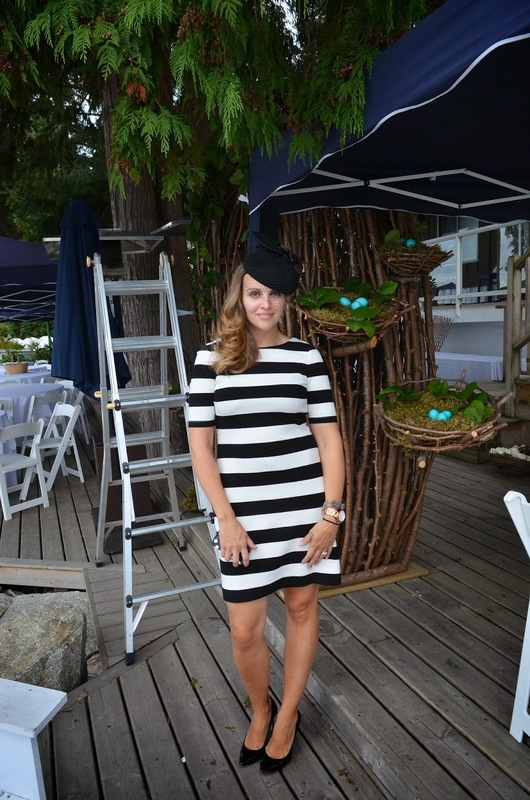 I always love stripes, and many of the women chose to wear hats in support of cancer. Even though we don't always like to bring our kids to weddings, they were with us this time so I needed something I could chase them around in. I was comfortable in this stretchy knit dress, and the hat/fascinator stayed in place all night long. I'll post more wedding photos soon, the decor was absolutely stunning!